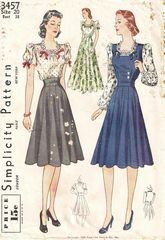 Versatile pattern to create jumper with blouse or skirt with blouse outfit. The 12 gore skirt with wide waist yoke can be made in evening or day length. The jumper has square front neckline, rounded back neckline and side placket for closing. Peasant style blouse with gathering at square neckline may have short puffed sleeves or long Bishop sleeves. Envelope is complete; soiling and scuffing to edge areas. Pattern pieces and instructions are in very good condition.